Home » Science Notes Posts » Astronomy » New Moon For Saturn? NASA’s Cassini spacecraft may have arrived in Saturn in time to witness the birth of a new moon. 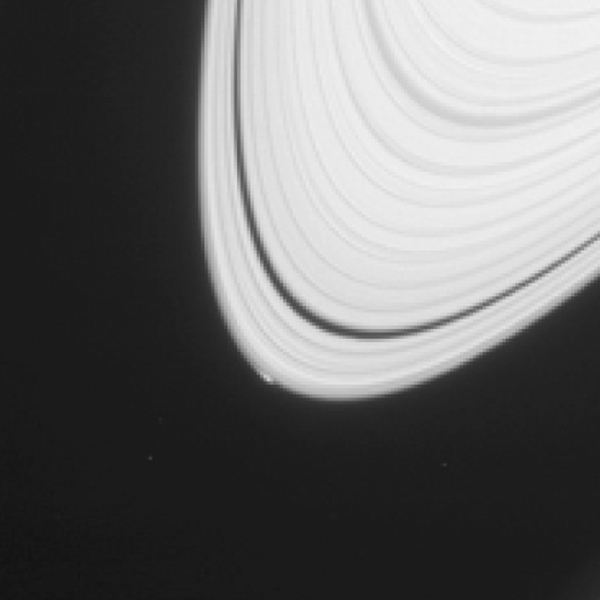 On April 15, 2013, Cassini took images of the edge of Saturn’s rings. One set of images had evidence of a disturbance in the outermost ring or A Ring. The disturbance measured 1200 kilometers long and 10 kilometers wide and was approximately 20% brighter than the rest of the ring. NASA scientists believe the disturbance is caused by gravitational effects of a tiny baby moon. Peggy, the moon’s unofficial name, is estimated to be less than a kilometer in size and not expected to get much bigger. Peggy’s discovery has led to new theories in moon formation. Saturn has over 60 moons and are mostly made of the same material that makes up Saturn’s rings. Did Saturn have a much larger ring system where other moons formed by combining chunks of ring material and breaking away? NASA’s Cassini mission keeps finding new things about the sixth planet of our solar system. Who knows what will be discovered next?